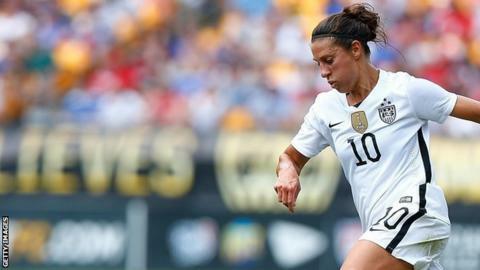 Midfielder Carli Lloyd, the first woman to score a hat-trick in a World Cup final, says she would consider moving to the Women's Super League in England. Lloyd captained the United States to a 5-2 victory over Japan in July's final, netting three goals in 13 minutes. The 33-year-old, who plays for Houston Dash in the US National Women's Soccer League, says a future move to the UK is "in the back of my mind". "I think that league is growing a lot," she said. "It's the next up-and-coming league. It's doing well and it's cool that it's a part of the Champions League. "I wouldn't be opposed to it." Should Lloyd move to the WSL, she would become the second senior United States national team player to do so, following Whitney Engen's move to Liverpool in 2013. The two-time Olympic gold medallist, who has been capped 204 times by her country, says any potential switch would have to be carefully planned so it does not affect her international availability. "This next year is Olympic preparation and obviously very busy but there are a couple of down years that we have," she told BBC World Service Sportsworld. "It makes it extremely hard for our national team coaches to be able to bring us in and out of camps if we're overseas playing for another team, so it's something to maybe touch base with in those off years. "I know a lot of our players have gone overseas and enjoyed it and I'm sure more will want to do that at some point again. "Who's to say I won't go over and experience something new, so it's definitely in the back of my mind. "But I haven't given it too much thought as of yet just because there's a lot going on now."